A little background on the thermogenesis process may be helpful; the NIH describes it as the “process of converting nutrient calories into the heat energy essential for body homeostasis, that is, thermoregulation, maintaining healthy metabolism, and body weight control.” And while the best approach to weight loss and is decreased caloric intake and regular exercise, thermogenic supplements can be an ally in the fight. Thermogenic supplements, even non-stimulant ones, are substances that stimulate that process – increase metabolism – with the non-stimulant ones being likely safer since they don’t produce cardiovascular effects. 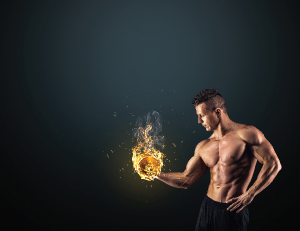 Stimulant thermogenics like ephedrine and caffeine, the former which has largely been banned ”because of the reported high incidence of adverse effects when used at doses higher than recommended, while caffeine is the worlds most consumed stimulant,” says NIH. So assuming that you’re not pumping way too much caffeine into your body and recognize the effects of ephedrine, let’s look at the non-stimulant thermogenics that can help in the fat-fight. The NIH provides examples including: bitter orange extract, although similar to ephedrine, it’s the natural cousin and poses no cardiovascular effects; green coffee bean extracts; green tea extracts; forskolin, which helps promote thyroid function (it’s a herb in the mint family); and capsaicin. Let’s talk about capsaicin. Found in hot peppers like jalapeños and habañeros,capsaicin just may be one for the best metabolism-boosting foods you can eat. Actually fruits, these hot peppers, the habanero being about 10 times hotter than the jalapeño, while alone won’t make you lose weight, they nonetheless help speed things up so incorporating these peppers, all high in potassium and vitamins A C, and E, in your diet can assist your body in its fight against fat and maintain a healthy heart. “These plants’ extracts when used in combination with well‐known thermogenic agents offer great potential for enhancing energy metabolism and production without adverse effects. Potential benefits of various combination products include weight loss and weight management, increased alertness and energy, and enhanced sports performance,” NIH says.